DC’s streaming service DC Universe kicked off last year and has brought us the original live-action shows Titans and Doom Patrol plus a continuation of Young Justice, and it has Swamp Thing, Stargirl, and Harley Quinn on the way. And that service also has quite a number of older DC-related shows available for streaming. Among those are Batman: The Animated Series plus the animated Batman entries that followed that like The New Batman Adventures, Batman Beyond, and Batman: The Brave and the Bold. It also has Superman: The Animated Series plus the Justice League animated shows that followed it. Among live action selections, the streaming service has the one and only season of 1990’s The Flash, the 1950’s Adventures of Superman, 2002’s Birds of Prey, and more. It even has the super-cheesy (but a ton of fun) Legends of the Superheroes from 1979 that brought back Adam West and Burt Ward and Batman and Robin and teamed them with other DC superheroes. The service also has many of the direct-to-video animated movies like Superman / Batman Apocalypse, Batman: Mask of the Phantasm, and Justice League: Doom. 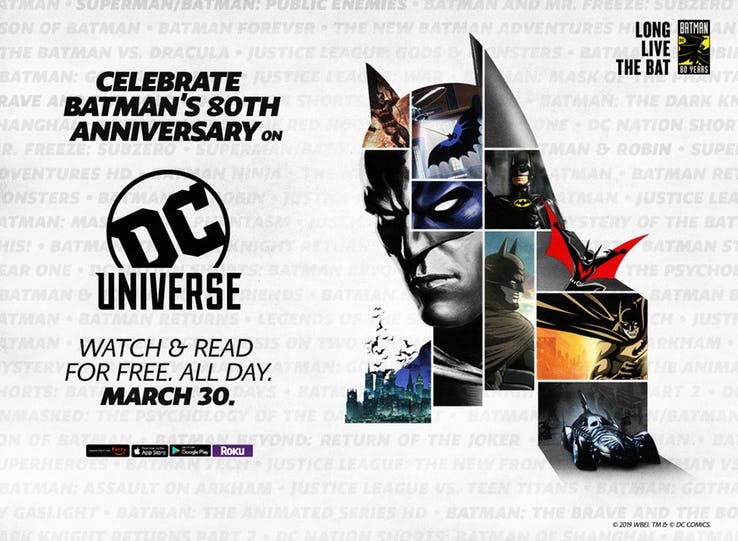 To celebrate the 80th anniversary of the first appearance of Batman, DC Universe will be free for one day starting at 11:59 PM EST on Saturday March 30th and going through the next day. In addition, if you sign up for the service from March 29th through April 4th, the first month will be 80 cents and will then go to the regular price of $7.99 a month after that. Also, currently the first episodes of Titans, Doom Patrol, and Young Justice Season 3 are available for free. So for fans of the DC properties, especially the animated TV shows and movies, this is quite a good opportunity to to sign up and start binging some of your favorites (see list of shows below). More info on the service at this link.